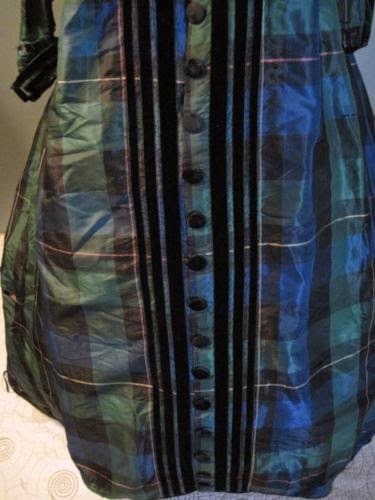 Spectacular green & blue plaid silk maternity (?) 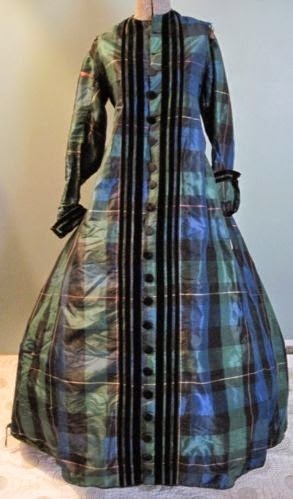 bustle dress from the mid 1800's for study and/or display. 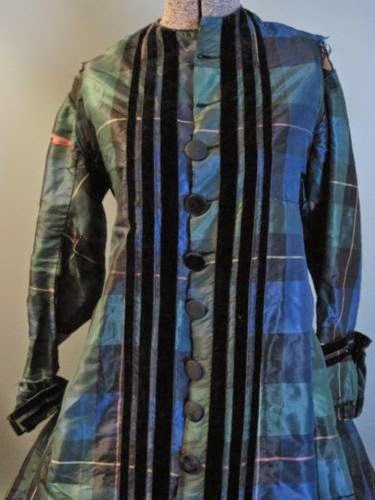 It has 3 rows of black velvet along both sides of the black fabric covered buttons, black velvet accents on the beautiful bustle area in the back and as well as along the cuffs. 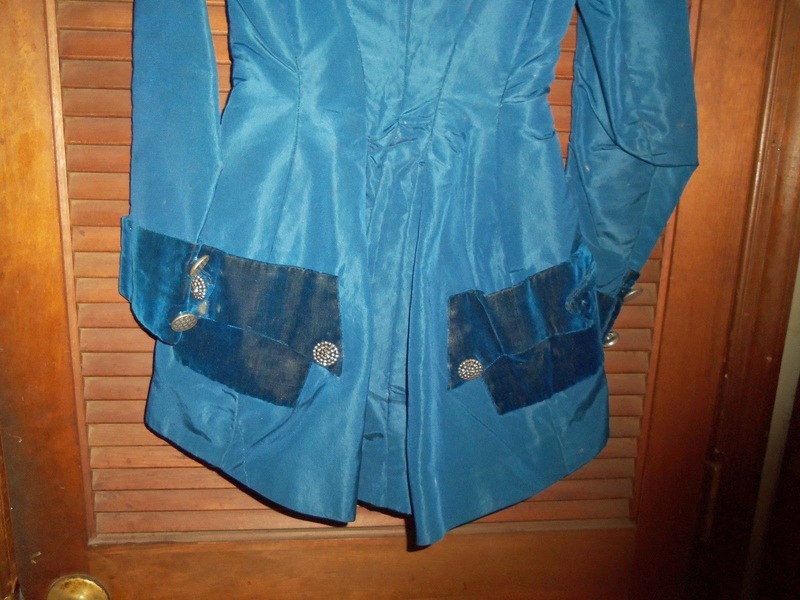 It has 5 button closure at the top (the top 2 buttons are missing) and then 4 hook and eye closure near the waist and the rest of the way down it is faux buttons (that do not open). 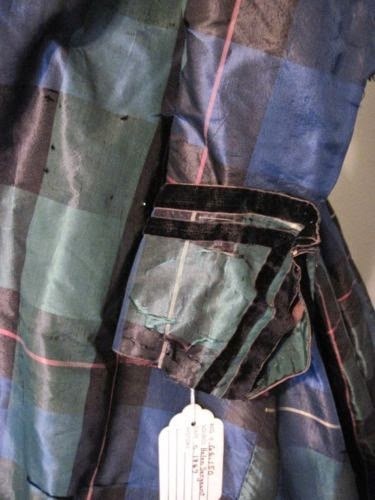 There is piping along the shoulder area. 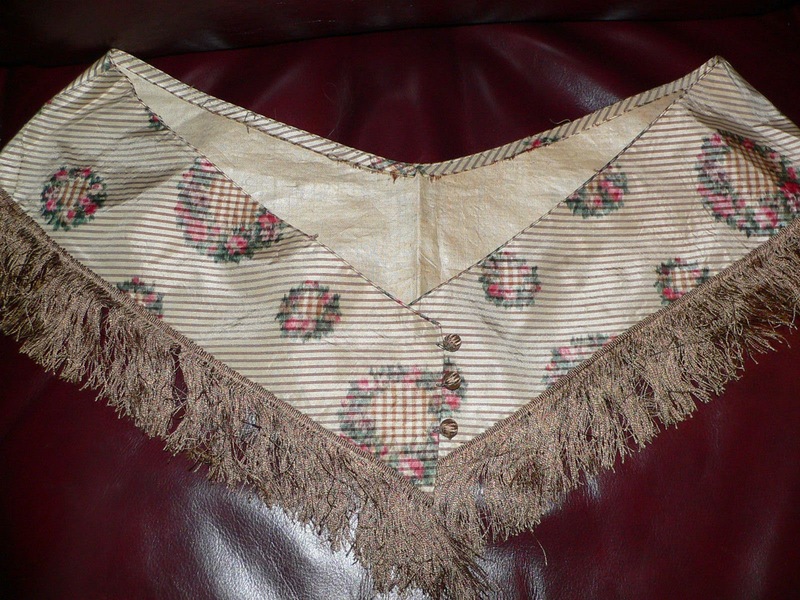 It is lined in brown and lots of handsewing on it as well as a few repairs, all of the black velvet ribbon was hand sewn on. 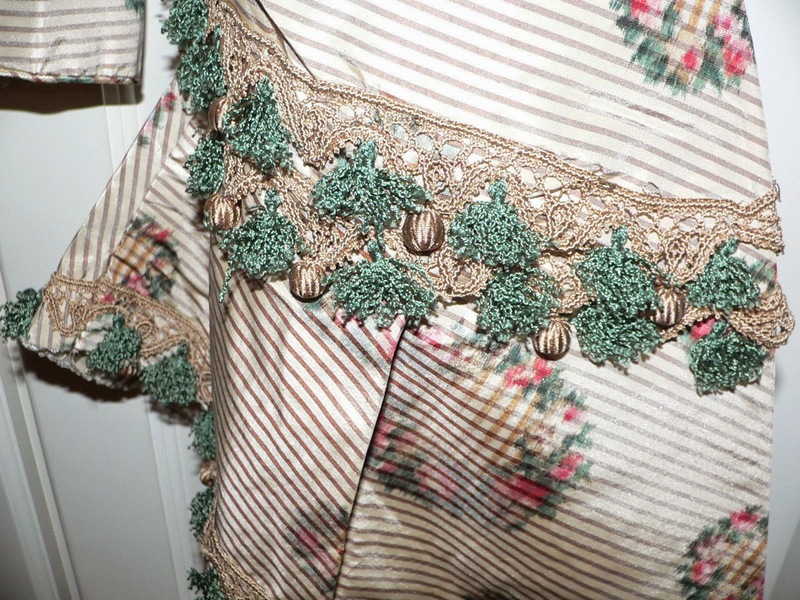 In the pocket was a tie with tassels on the end that has a small silk ribbon flower on it that is included but the tassels needs some straightening. 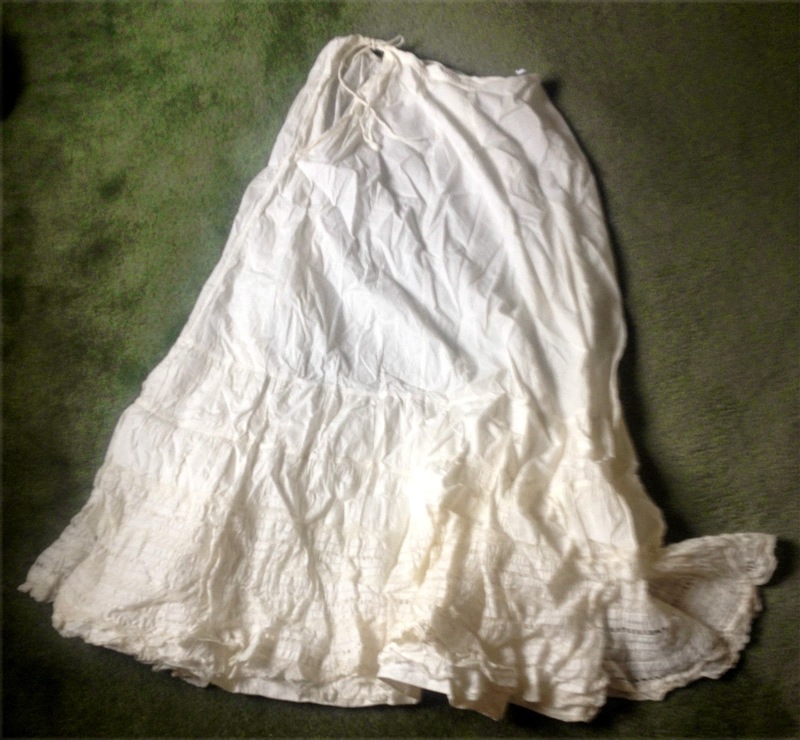 Possibly this was used as a robe also? 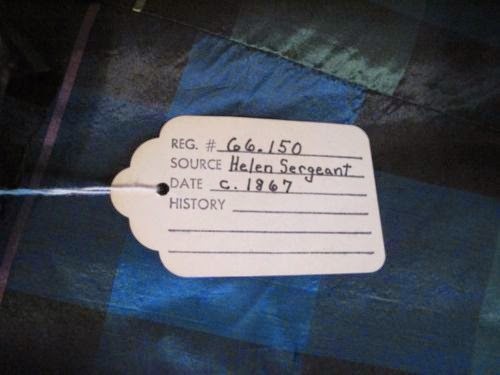 It has a label showing the original owner and the year "Helen Sergeant c. 1867". 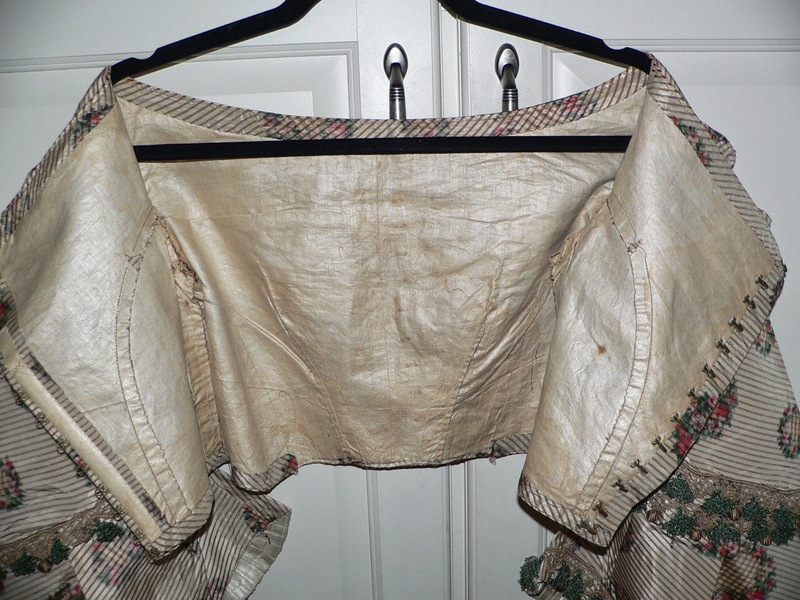 •about 53 1/2" shoulder to hemline in the front and much longer in the back at 59"
Gorgeous example of womens clothing in the mid 1800's. Please feel free to contact me with any questions. It very much looks like it could be from 1867 to me. :-) I'll be at Pennsic for the next couple of weeks stuck in the early 16th Century. I probably won't be able to post at all until nearly mid August. See you all then! 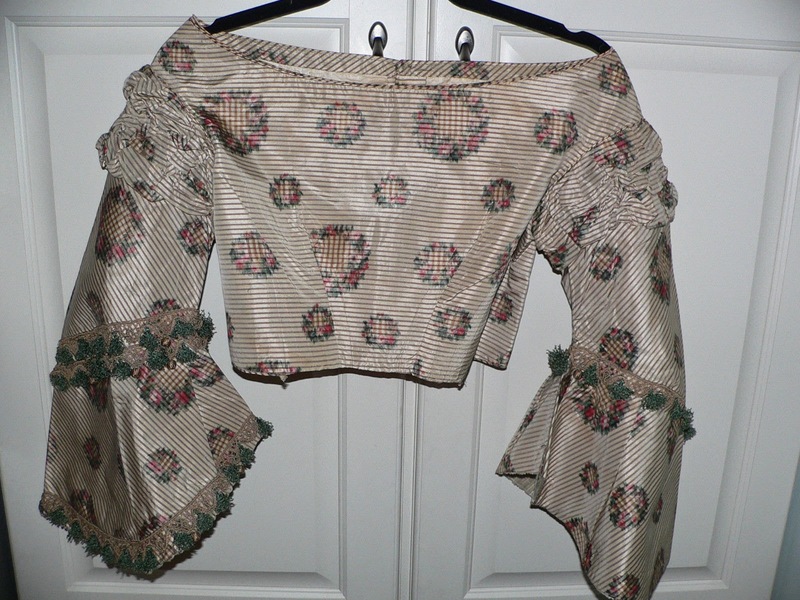 American Civil War Era Evening Bodice with Sleeves! 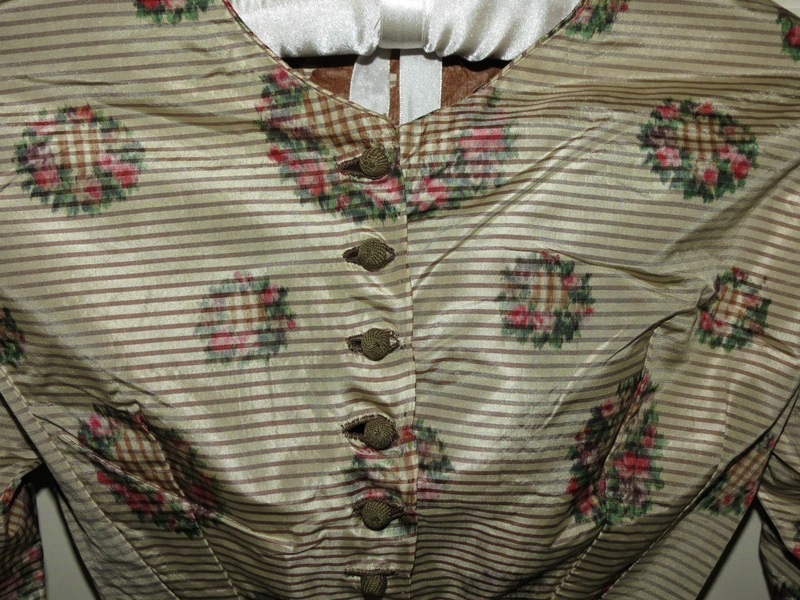 This bodice is from the Civil War era and is made of a a beautiful striped light tan with floral designs. It is the same material as another one listed. Sorry to say no skirt. 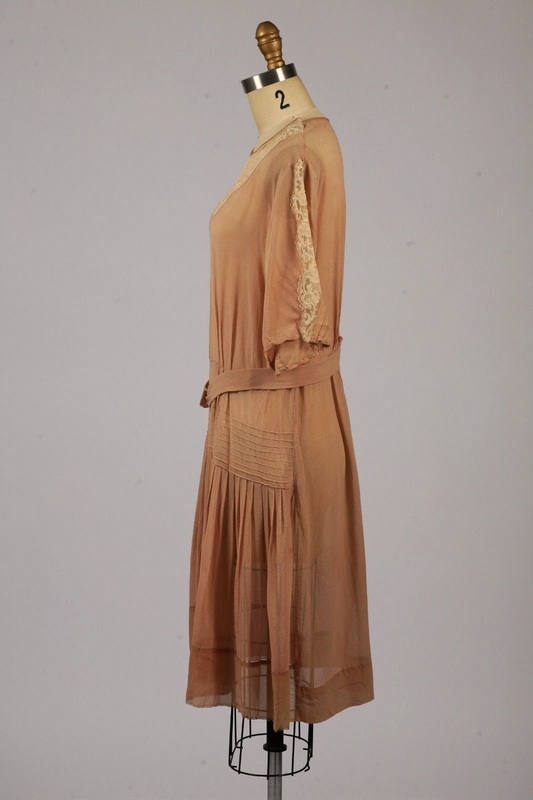 The front neckline is piped with dropped shoulders. Just below the dropped shoulders are gathers they then fall very wide. 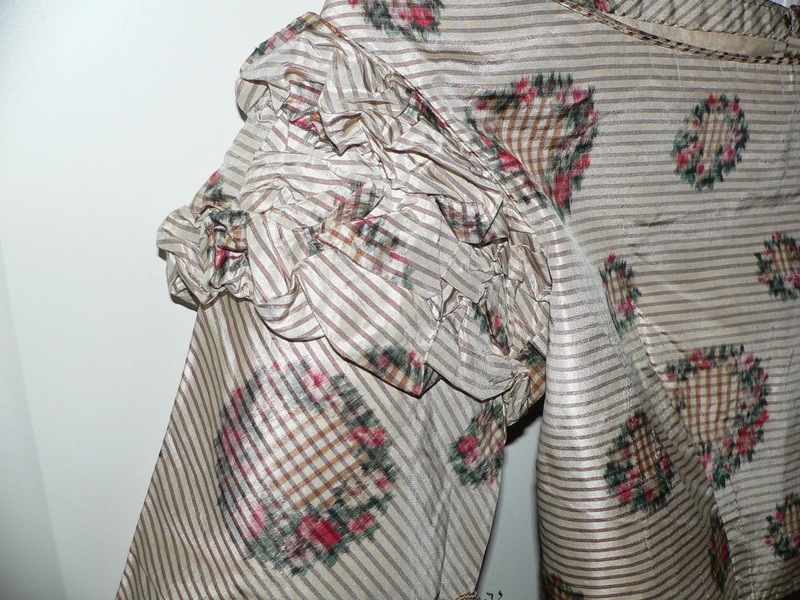 One sleeve has all the fringe trim double row on top then at bottom of sleeve single row of fringe. Among this fringe are golden crochet balls. 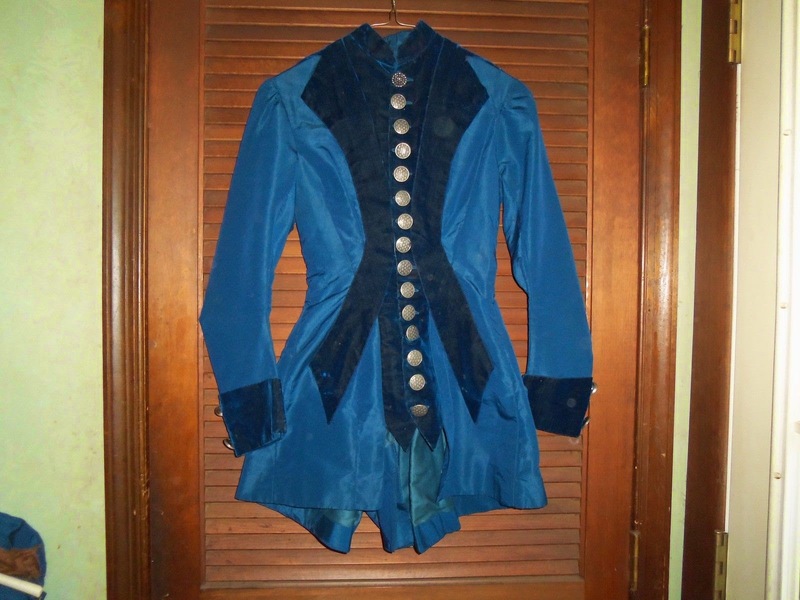 Many have either fallen off or been taken off and they were included with the bodice. 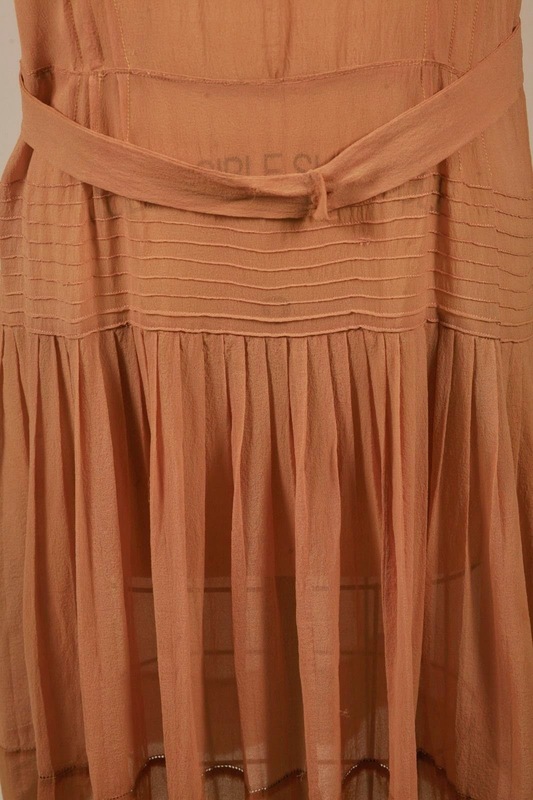 The other sleeve only has one row of fringe at the top. 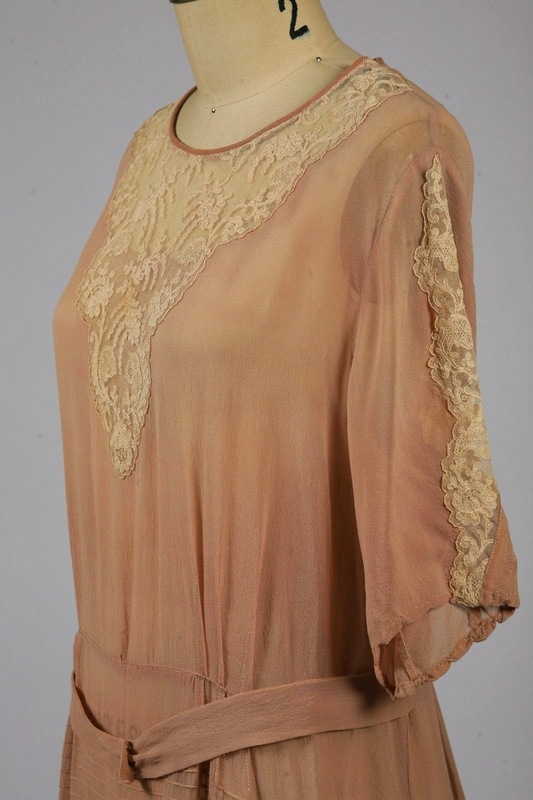 The neckline is double piped. 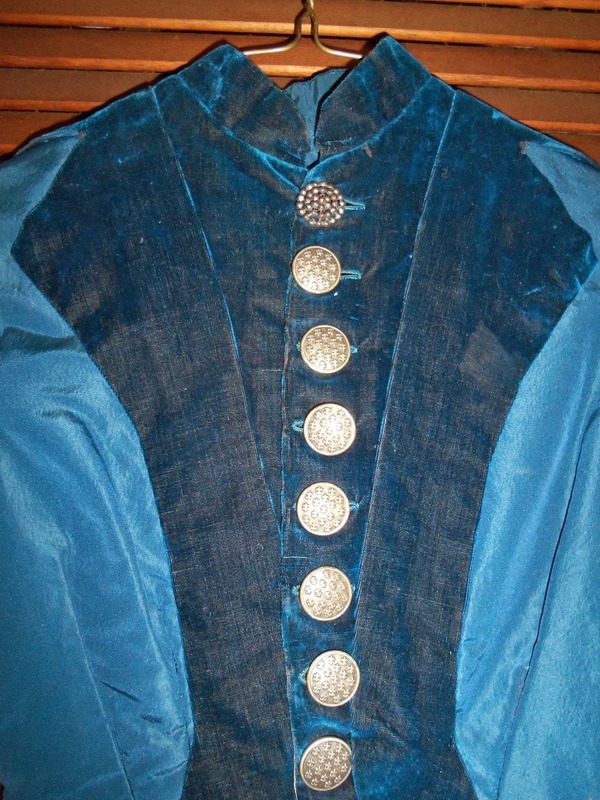 Hem and shoulders are also piped except where the bodice was taken apart. Any stays were most likely taken out as well. One stay is under the back under the eyes. 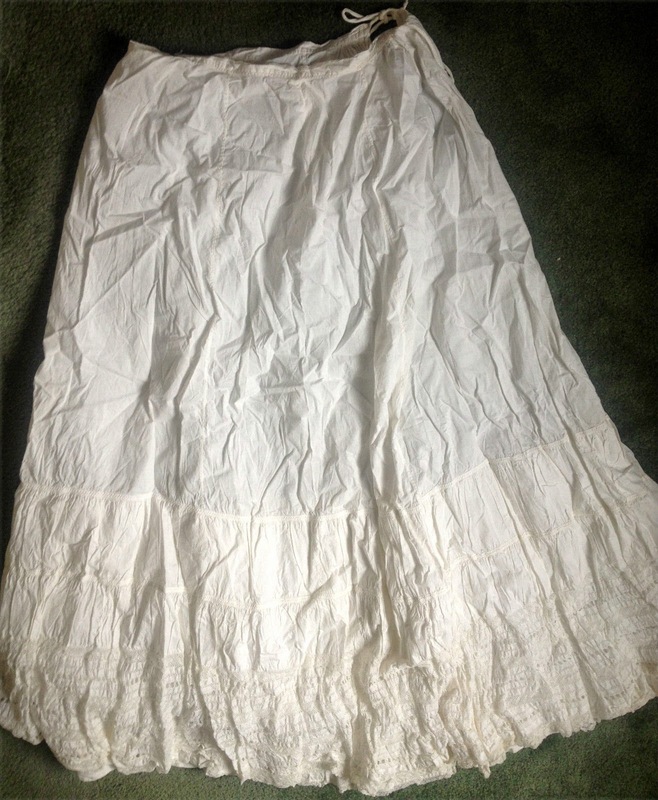 The inside is lined with a cream cotton. 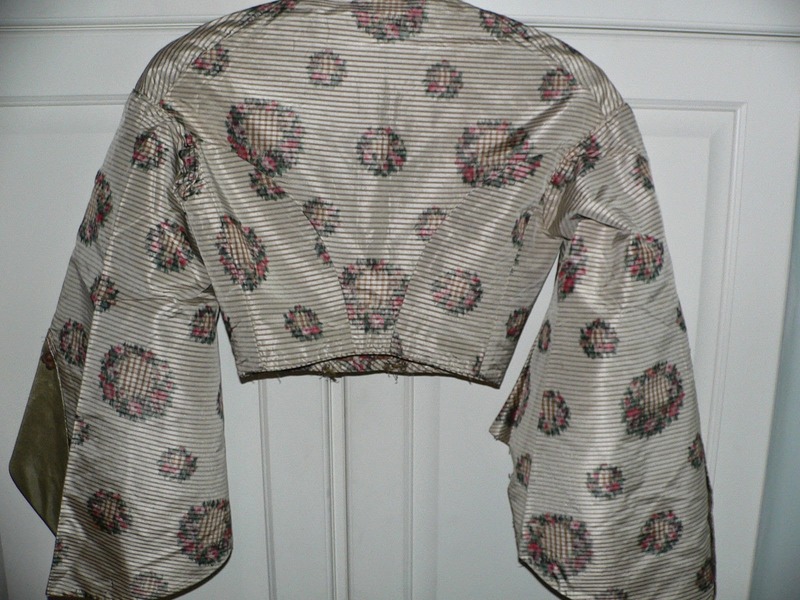 The sleeves are lined in a cream silk part way up and the end of the cream silk lining is pleated. Back closure is with eye hooks. 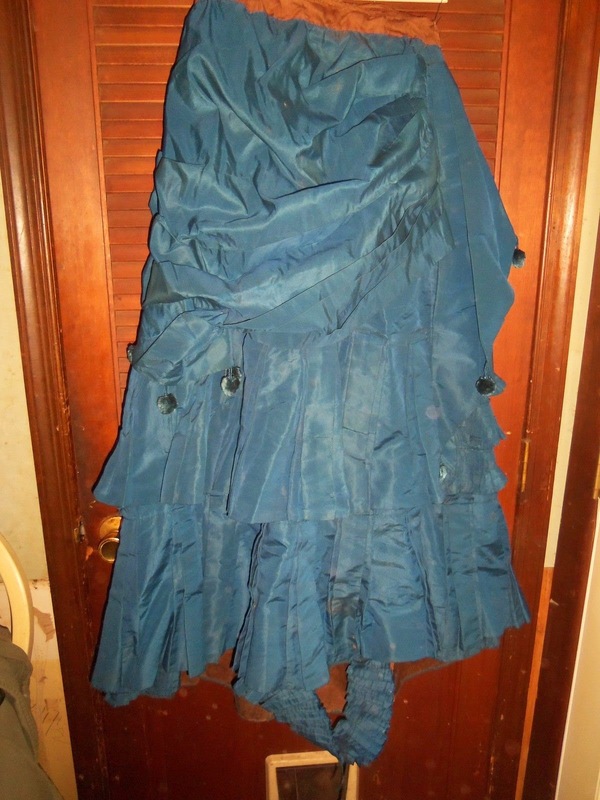 Measurements are approximate - bust 30 inches waist 24 inches across back about 14 inches,. length 12 and sleeve length about 21 inches. there would be a great display piece. 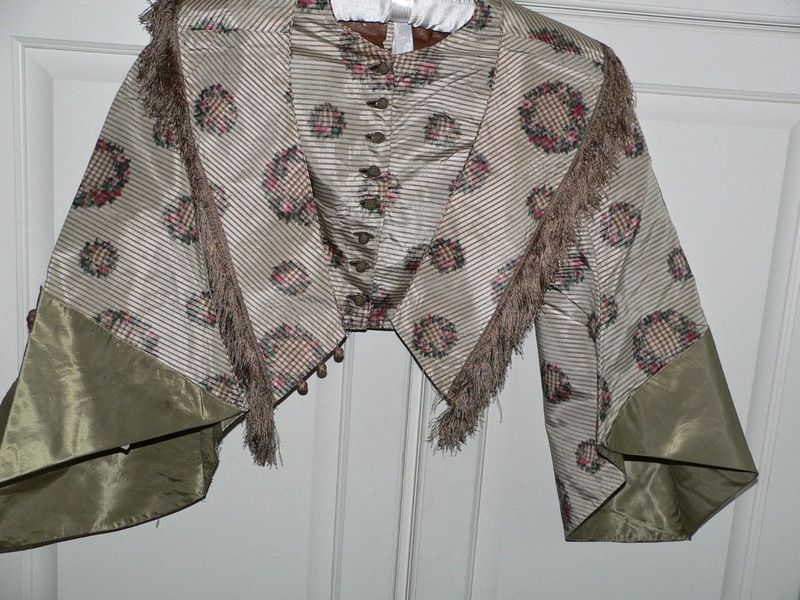 Condition - very good - fringe missing on one sleeve, pin holes from where bodice was taken out.Tiny hole at back of one sleeve. 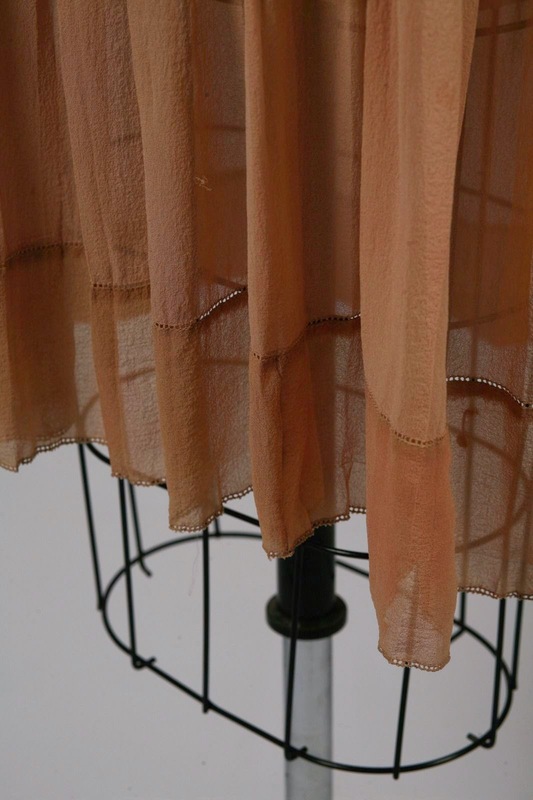 Silk is strong and no underarm discoloration. 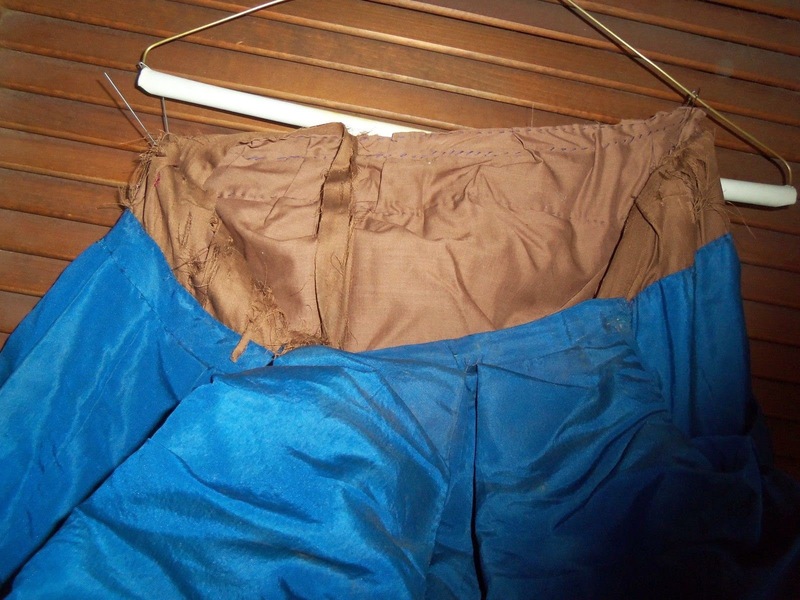 There looks like a couple of areas with very light discoloration.Lining has some light discoloration. This would display beautifully. 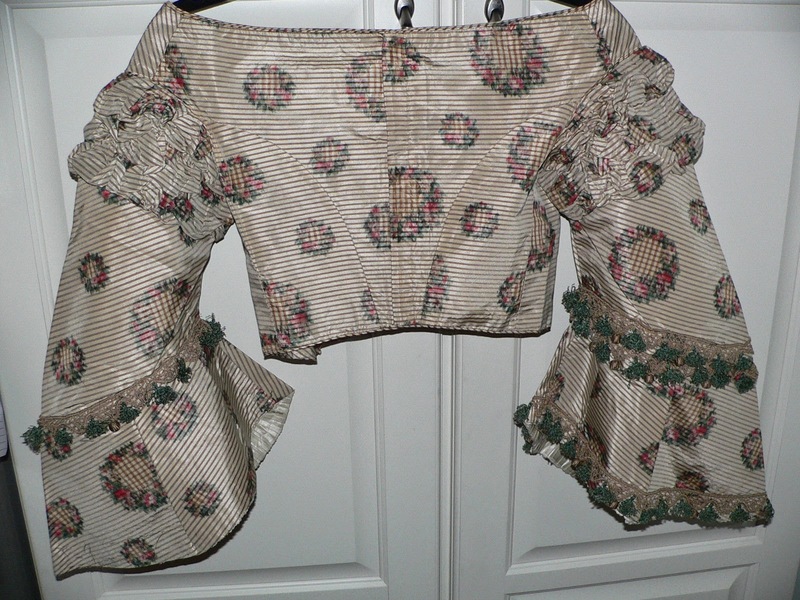 Check out the other bodice of same material from same estate on auction. 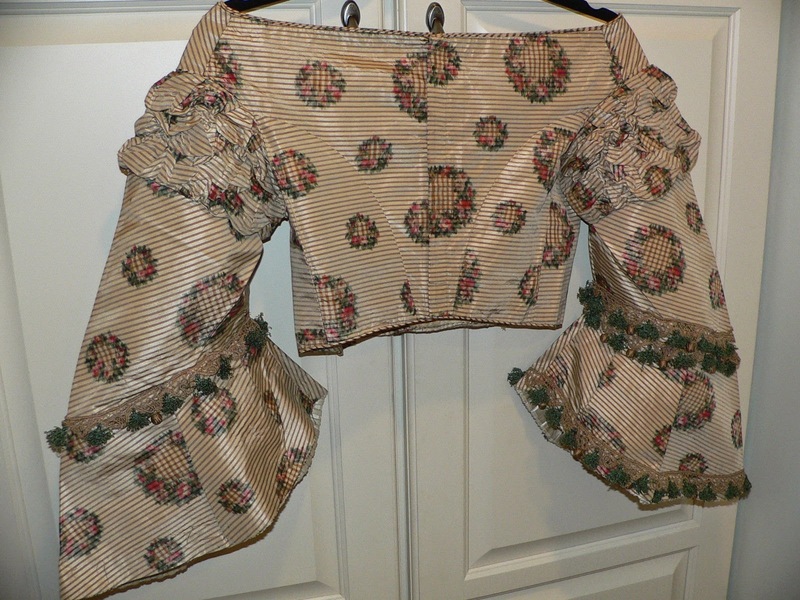 See the previous post for the day bodice and the Bertha that goes with this bodice. 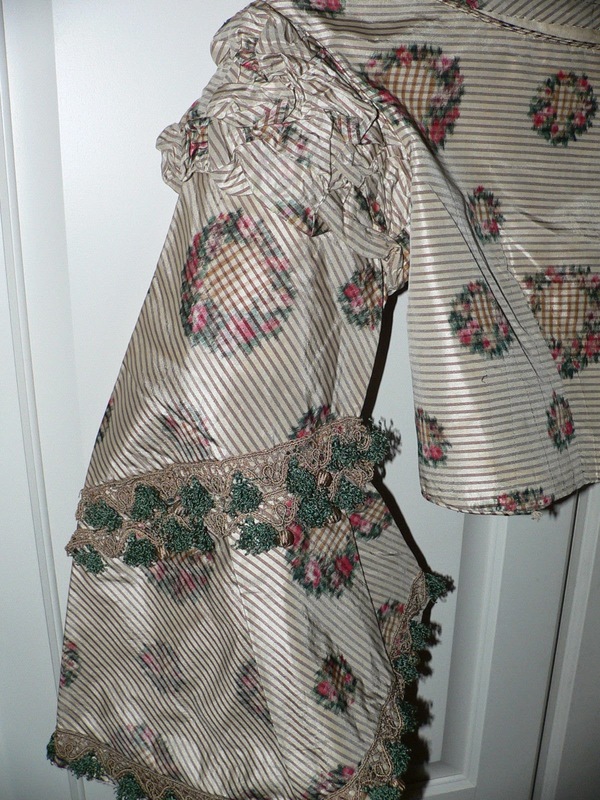 This is another bodice restyled from an older gown. 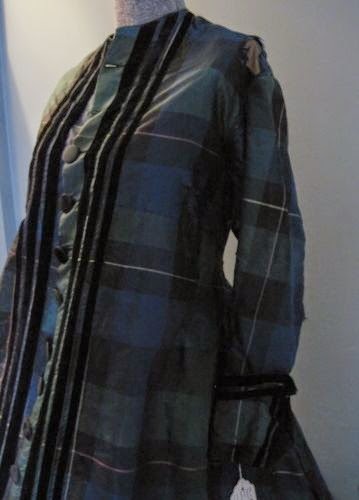 The sleeves give away the late 1850's look but the waistline is in keeping with the later part of the American Civil War. 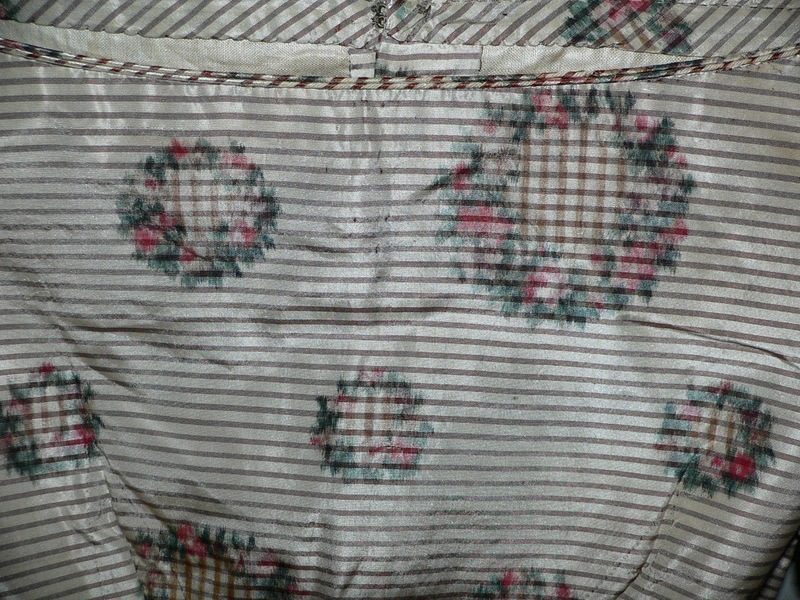 This bodice is from the Civil War era and is made of a a beautiful striped light tan with floral designs. 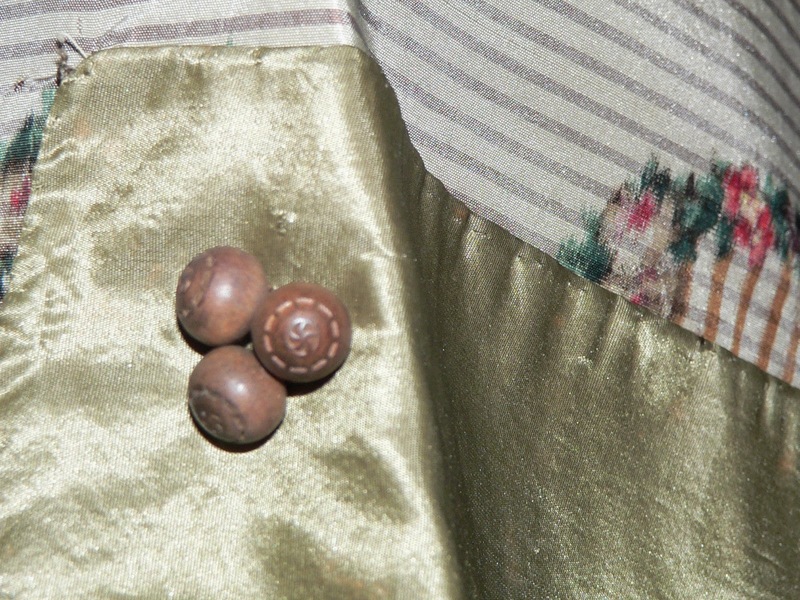 The front closes with 8 crochet covered green buttons and eye hooks. The sleeves are dropped and piped. 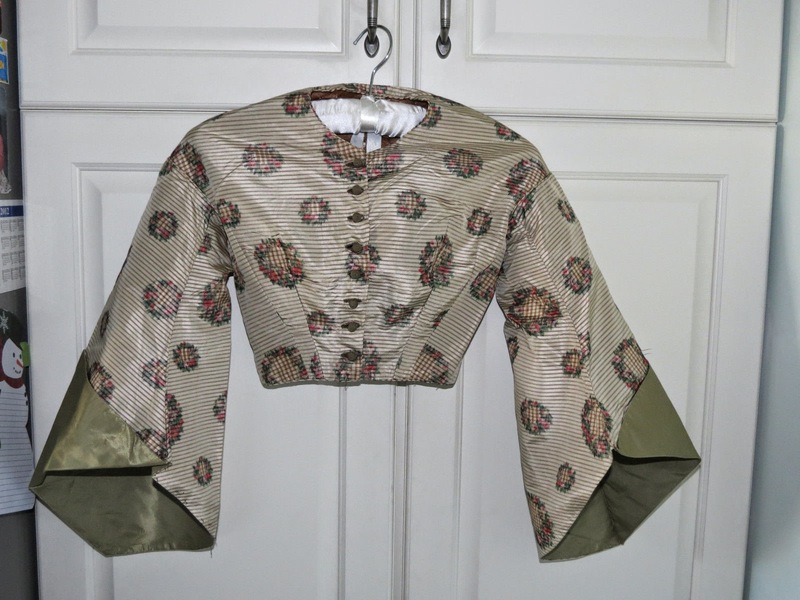 The sleeves are very wider and inside bottom of the sleeve is lined in an olive green silk which is folded up into a triangle with 3 small wooden buttons. The neck and hem is also piped. 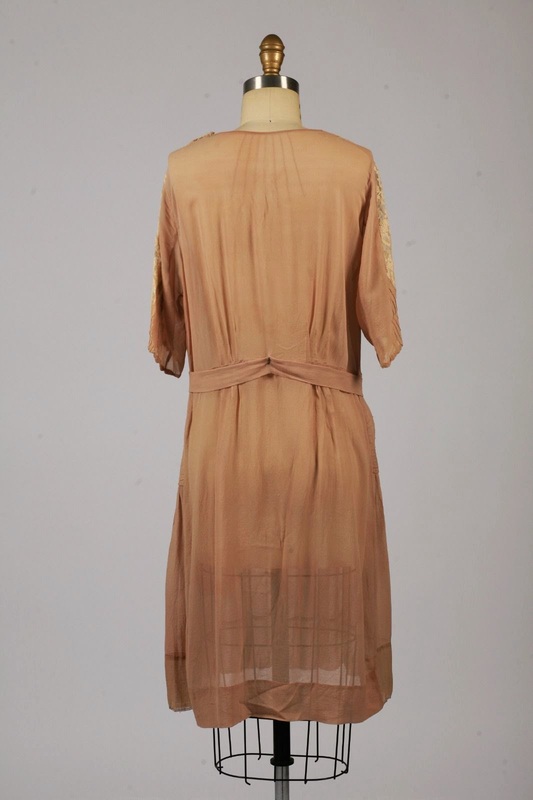 The inside is lined with a polished cotton that is deteriorating especially at the top of back neckline. There are 2 stays in the front. 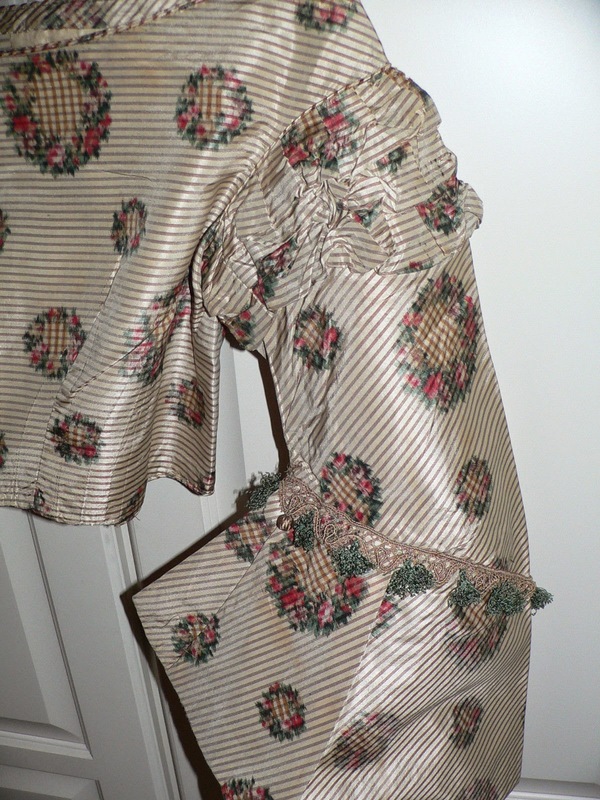 Included is a matching skirt sash or neck scarf. 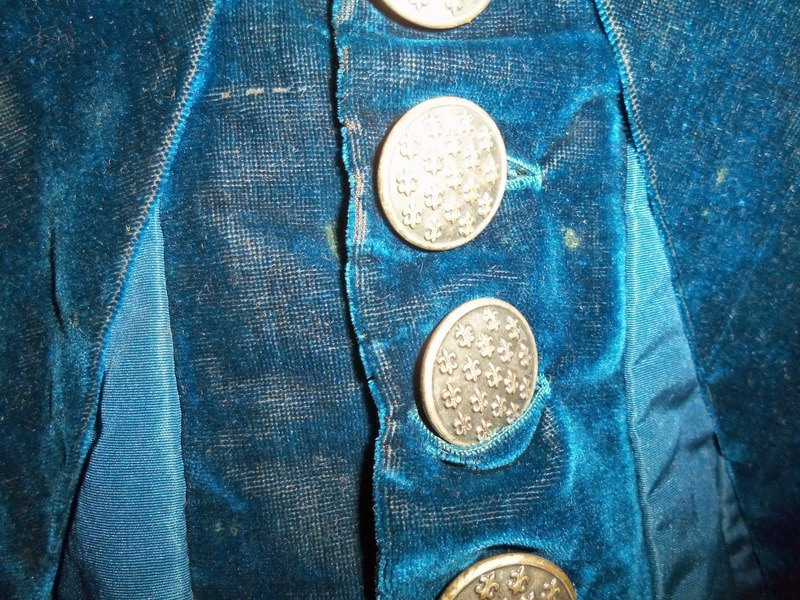 The material matches but the buttons are golden crochet instead of green. 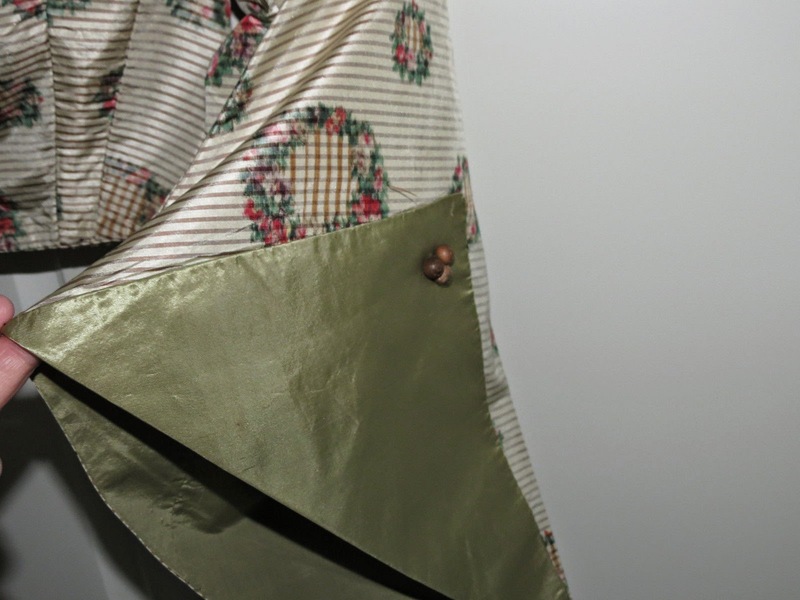 There are no hooks on this piece for closure. 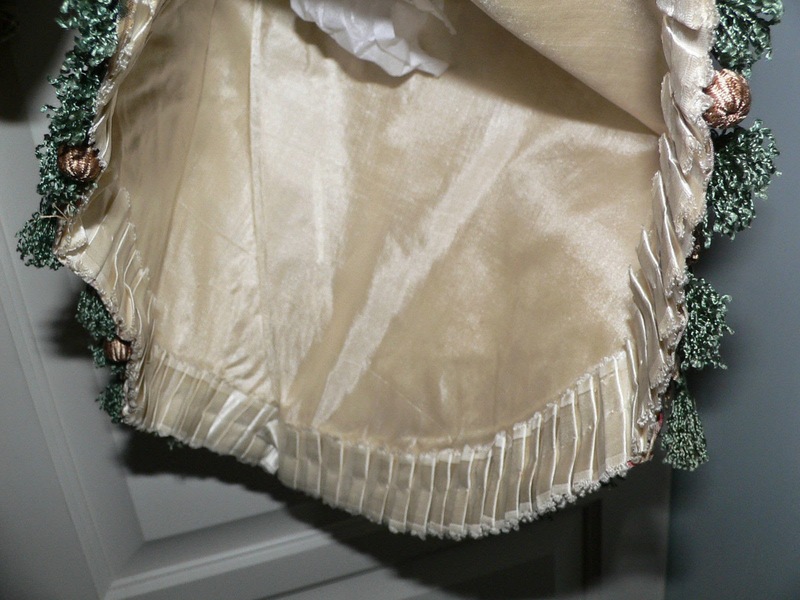 I have another bodice of same material different trims from same estate. 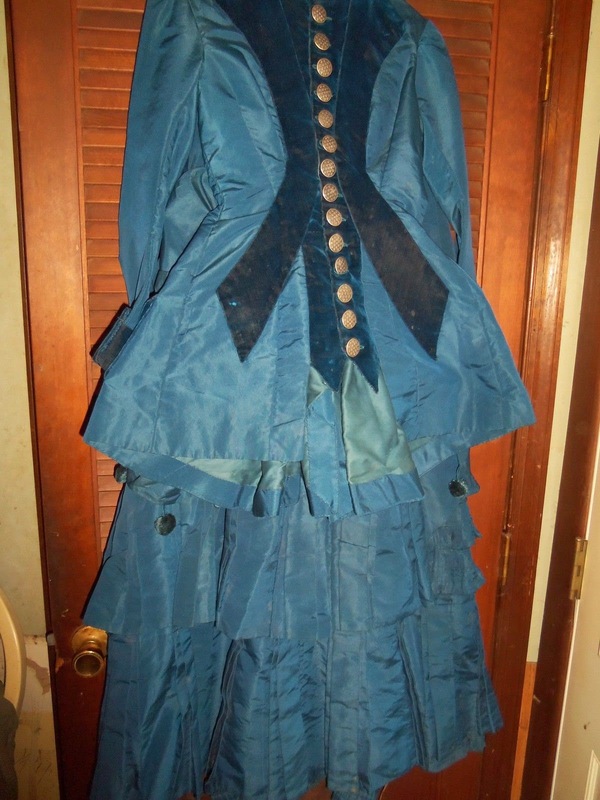 Measurements are approximate - bust 29 inches waist 20 inches across back about 13 inches. length 14 and sleeve length about 17 inches. there would be a great display piece. 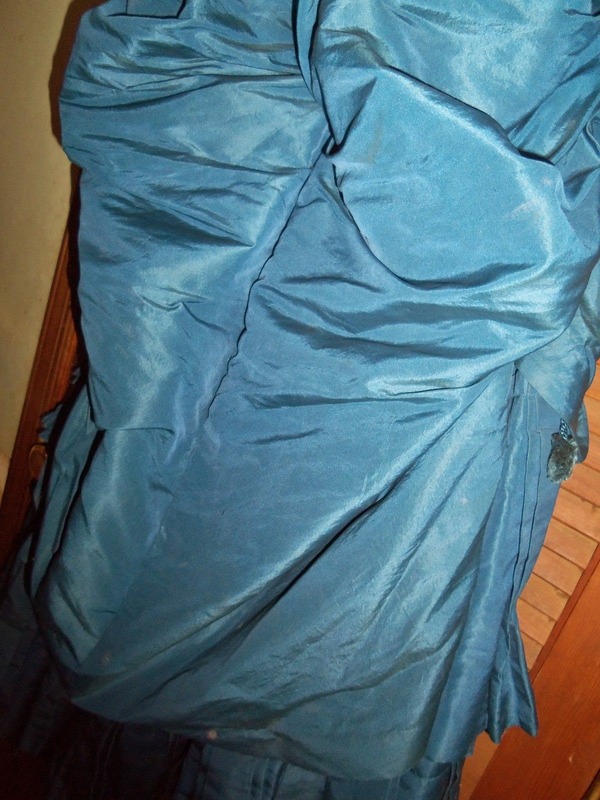 Condition - very good with 3/4 inch splits just at front of arm pit and also at back on bottom of one sleeve. Couple of light small to tiny light spots. 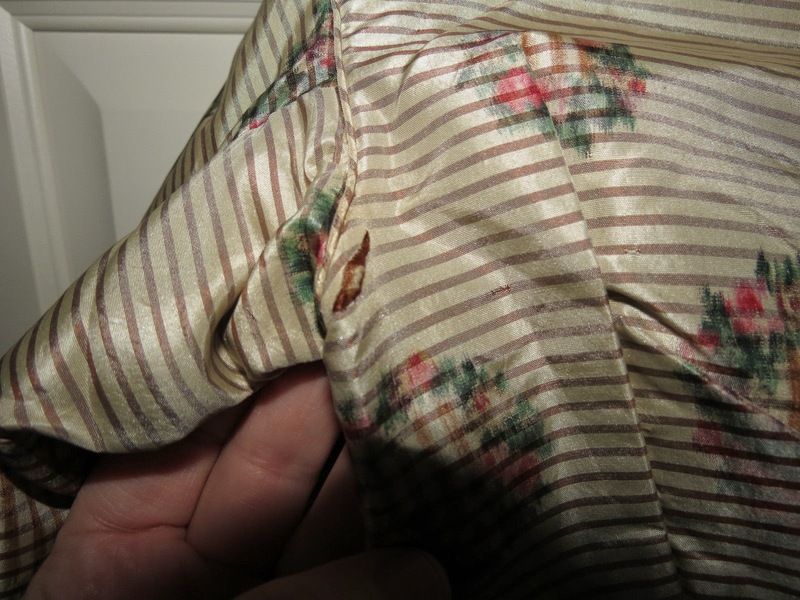 Inside lining is deteriorating, back of neck area is the worse.Spits do not show when bust is filled out. You won't be disappointed with any of these; check out all 3 pieces. 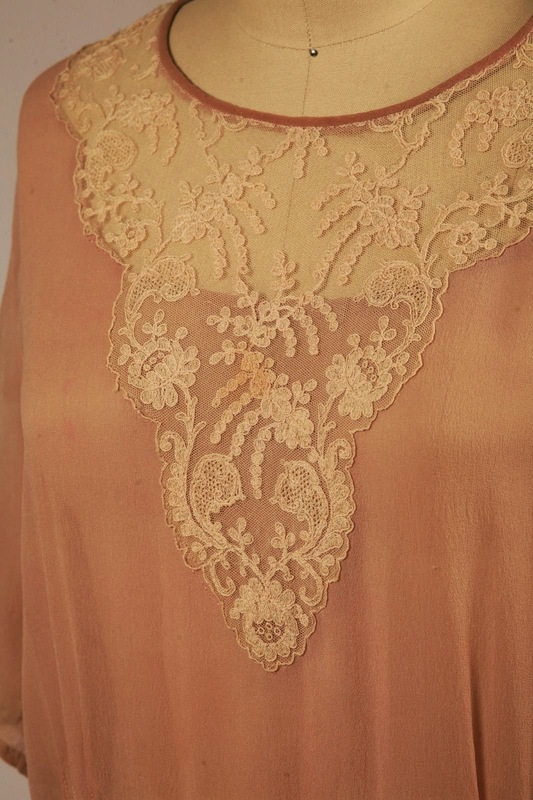 They are like whipped cream - lace and beautiful stitching everywhere - absolutely beautiful. 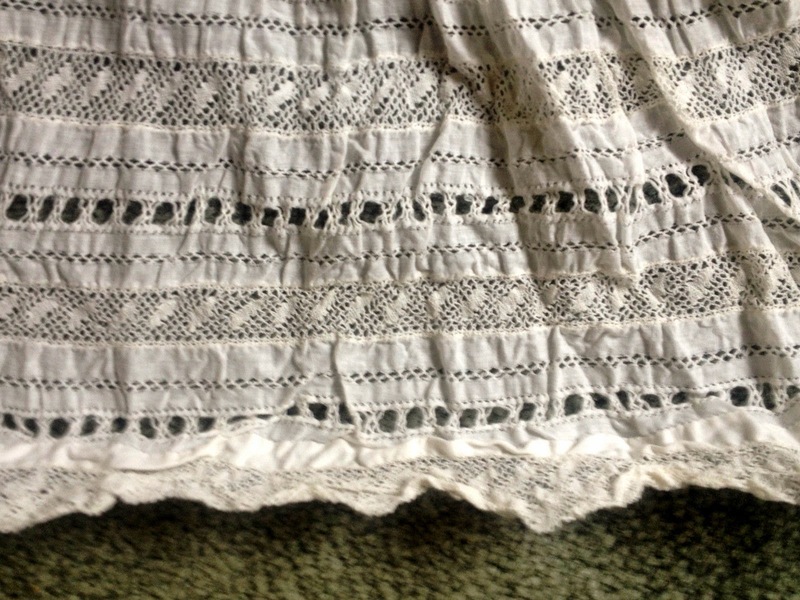 This slip is 37" long and has a dust ruffle under the outer lace hem that's 11" long and gathered. 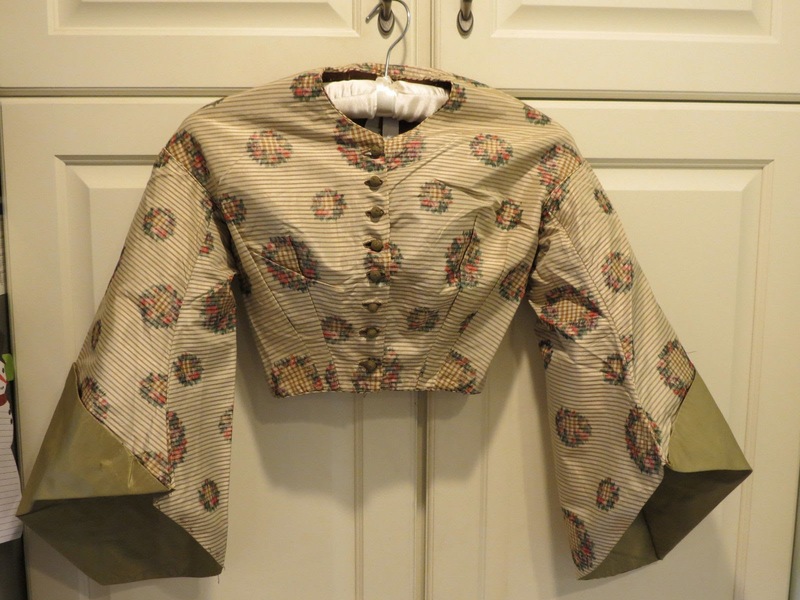 The waist is 26" with a tie for multi-sizing. 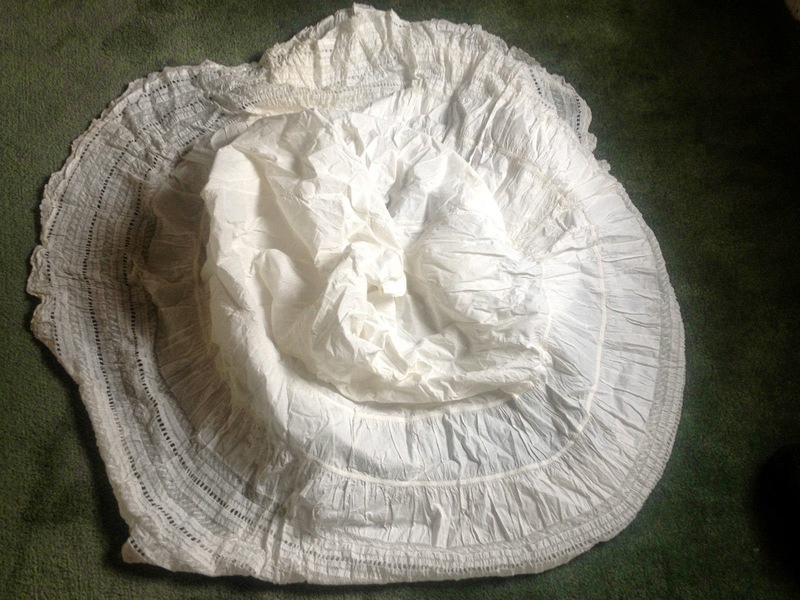 Sweep of outer skirt is 104"
Based on the way the petticoat is decorated and the length, I'm thinking Edwardian for this one. 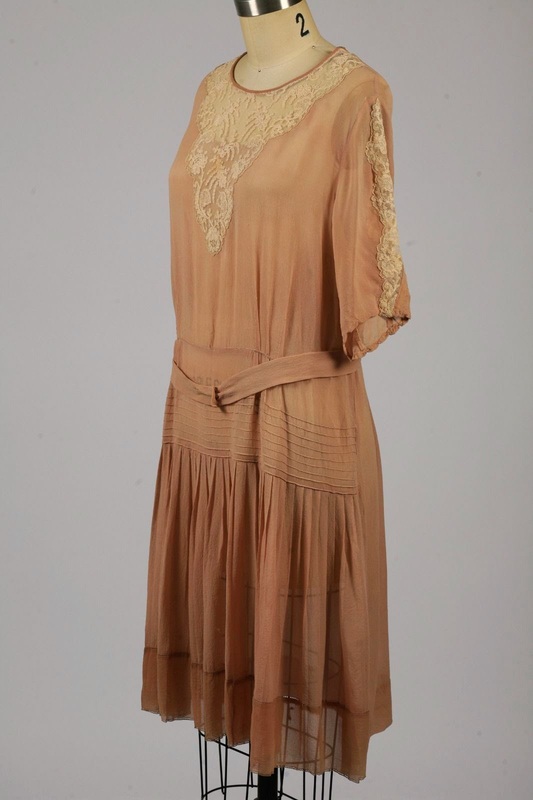 Vintage 1920s light brown chiffon flapper dress with lace neckline and lace down short sleeves. 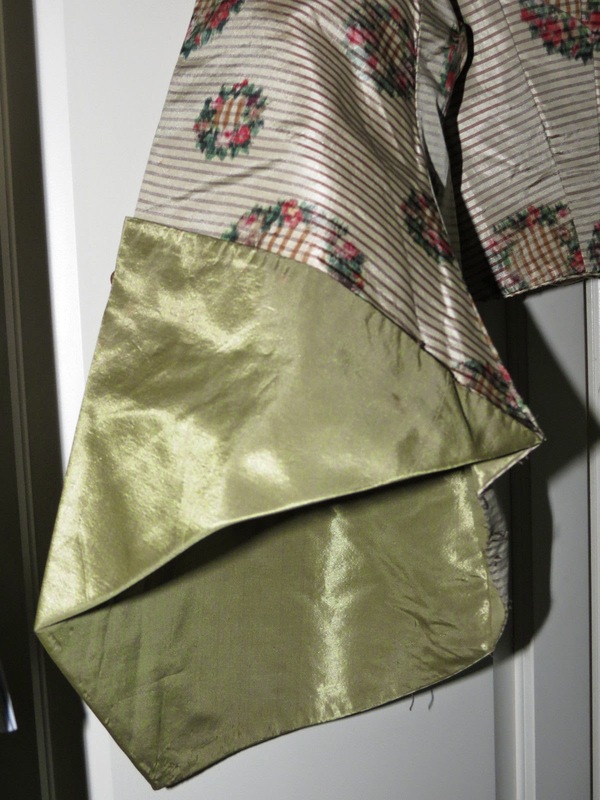 Pin tuck seams at back neckline. 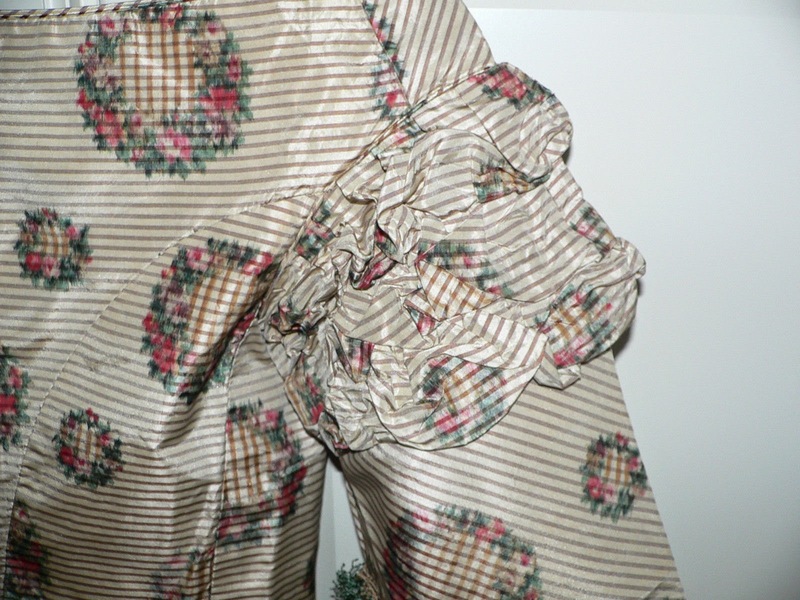 Darted waist seam with drop waist band above hips with rows of pin tucks. 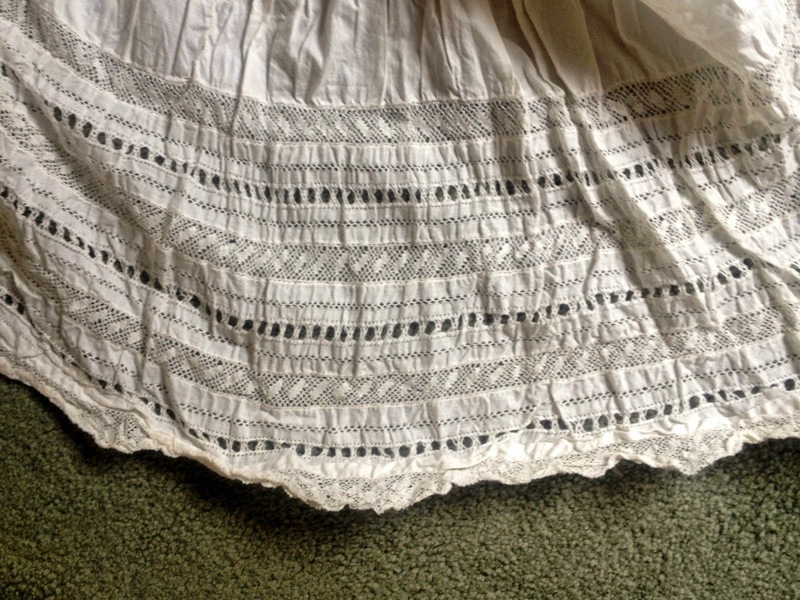 Pleated, loose fitting skirt with picot stitch hem. Sewn-on waist belt with metal snap closure. 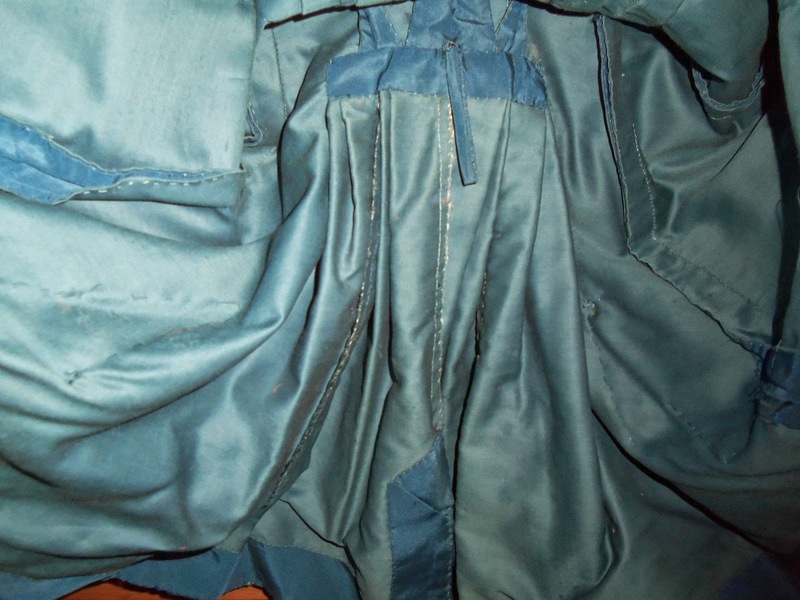 Only closure on dress is 2 metal snap closure at left shoulder seam. 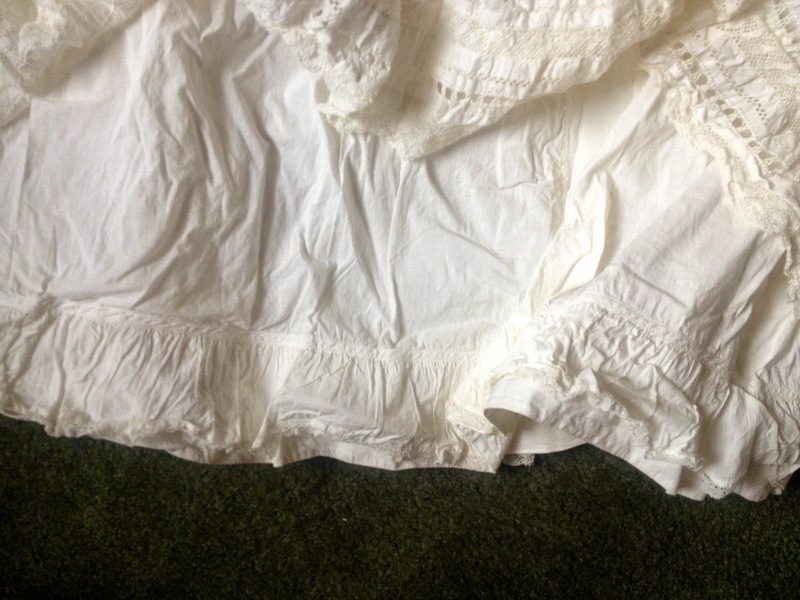 condition: okay; some yellow spotting on lace, yellowing at underarms, some open seams that can be mended, some tiny pin holes throughout. 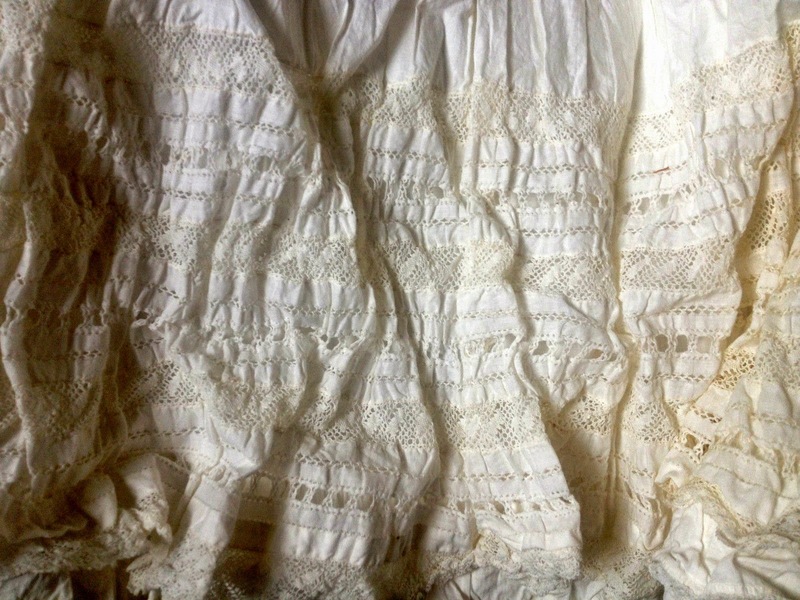 Some tears at lace shoulder seams. SOLD AS IS.